A superbly well-constructed and delivered present­a­tion revealed that Hardstoft – near Tibshelf ser­vices — in East Derbyshire was the site of the first deep oil well in the UK – maybe the world — and we all thought it was in the Middle East! Sadly it has mostly run out now except for a little that is pumped up on the Duke of Devonshire’s estate which should help to keep his home fires burn­ing! One of the deep­est wells was Duke’s Wood, not far from Hardstoft, at over 7000ft. – a tre­mend­ous achieve­ment! Cliff has spent a life­time in the oil industry and it showed – his know­ledge and present­a­tion skills were an object lesson on how to do it! 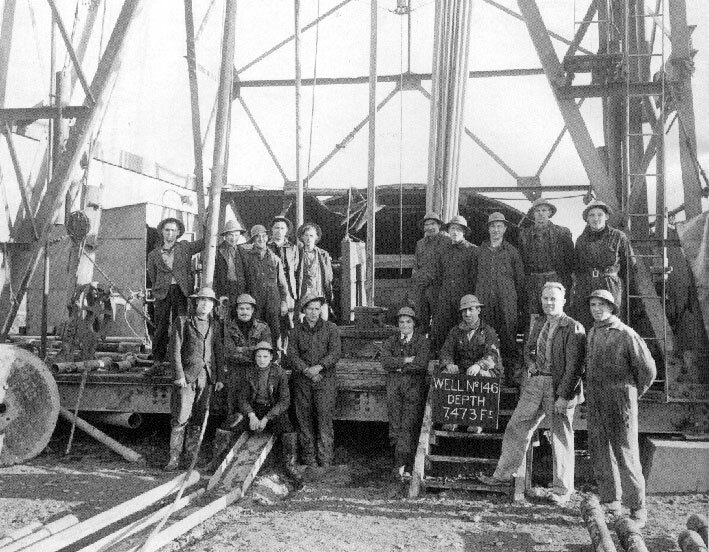 The deep­est well to be drilled at Dukes Wood was No 146 to a depth of 7473feet. 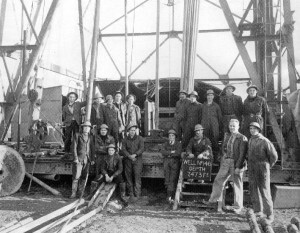 Pictured above are mem­bers of the drilling team involved in this achieve­ment.